Flashes of Style: Romwe Giveaway- Two $80 giftcards! Romwe Giveaway- Two $80 giftcards! offer not only one but TWO of you to receive $80 worth of freebies to their shop! The top is great! Very cute outfit! Oh I have been wanting to shop Romwe for a while now and this would be the perfect opportunity! Fingers are crossed! Love this giveaway and I adore your outfit! The collar is so cute! (I'm already following you via bloglovin')! Hey hon! Lovely givaway you're hosting! I'm already registered on Romwe and of course already following you on Bloglovin'! Following with bloglovin' and registered with Romwe.com! I love the little bows in your hair! I've always loved your style,Bonnie!this one is one of the cutest :) already followed you on Bloglovin! Signed up! Everything is so lovely! I know where I will now be doing a lot of my holiday shopping! I've registered and of course I'm already following you :) Thank you for hosting! I already follow you on Bloglovin. You can contact me with my blog. Yay! Thanks for hosting such an amazing giveaway! Always so excited to see your lovely outfit posts! I would love to win this- Romwe has such cute items! i love ur outfit!! lovely! Adorable outfit! 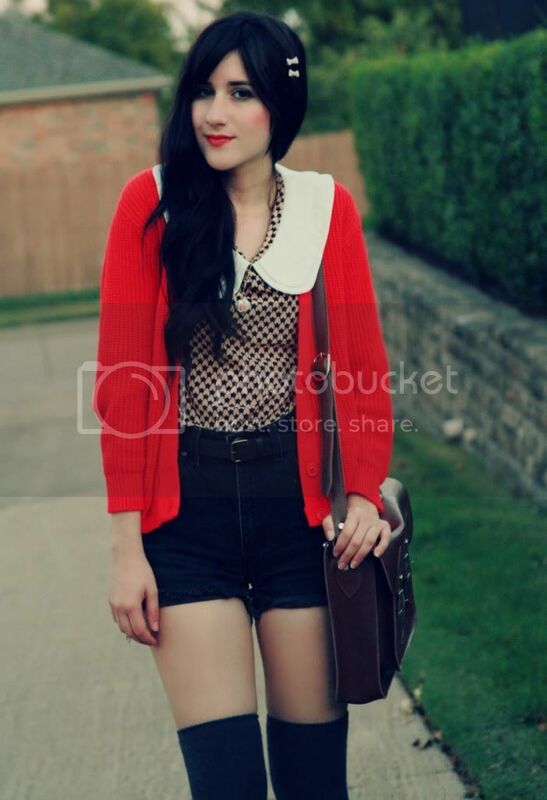 Love the red cardigan so much! That is such a lovely outfit, love the splash of colour. Red really suits you! Lovely outfit. 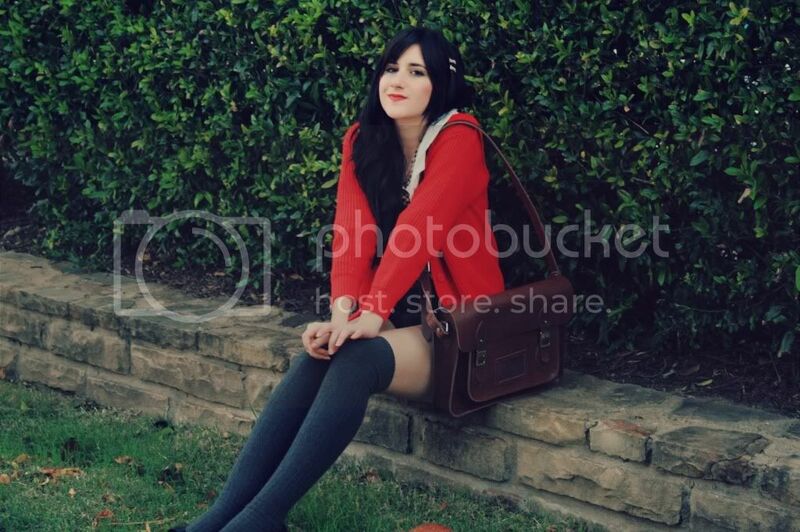 I love to wear red in the fall! LOVED your look! You have an amazing style, following you! Thanks for hosting so many great giveways! my email for the romwe registration : Bowtiediary@gmail.com . Love this outfit! Registered and following on Bloglovin! Yay! My email address is franniepantz@hotmail.com, I registered with Romwe and already follow you on Bloglovin. Hope to win! This top is adorable! you're gorgeous! i'm so iin ! Wow! I also love ROMWE..
Ooooh stunning outfit! I love the collar, and those shorts look awesome. Omg , a Romwe giveaway! I've never actually bought from there, but some of their stuff looks amazing! Ooh, thanks so much for the chance to win! P.S. I love your socks; they are the perfect fall accessory! xo. Great Giveaway ! Love Romwe ! Followed on Bloglovin'! I registered on Romwe, I follow you! I'd love to spend that money at Romwe! Done! I love Romwe AND your blog, this outfit is quite adorable as well. I've registered with Romwe, and now I follow you on Bloglovin'. I am already registered with Romwe and follow you on bloglovin! I'm following you on Bloglovin' and I signed up! This is such a great giveaway b/c Romwe has so many good pieces! I love the collar on your shirt! i've been wanting to check romwe out. i love that they have free international shipping since i'm in hong kong. i hope to be lucky! i've done all three things, now. You are just waywayway too cute Bonnie! I love your style, it's so well put-together and innocent-looking .. and you have AMAZING hair haha, however creepy that sounds. Super cute look! Your shorts and over the knee socks make your legs looks mile long! Your blog is amazing! I always love seeing how you put outfits together. Yay this is a great giveaway! I just love your outfit too. The top is adorable. I follow you on bloglovin' too. I'm registered to Romwe and am following via Bloglovin'! i LOVE when you wear red lipstick. your lips look like a little heart!---entering you're awesome giveaway, avid follower on bloglovin' and registered with romwe! I have registered on Romwe and have my fingers crossed. How could I not have already followed you on bloglovin? KEEN. I love your outfit! I love this giveaway!!! They have some really cute clothes! I love the top you're wearing!! I LOOOVE everything about this outfit! hey, thanks for the amazing opportunity. All the clothes are so cute... thanks for the giveaway!!! the outfit is simply perfect, bonnie! Such a great giveaway. I hope I win! This giveaway is just amazing, i love Romwe!! I absolutely LOVE those shorts! Adorable outfit, as always. I love Romwe! (who doesn't?!) 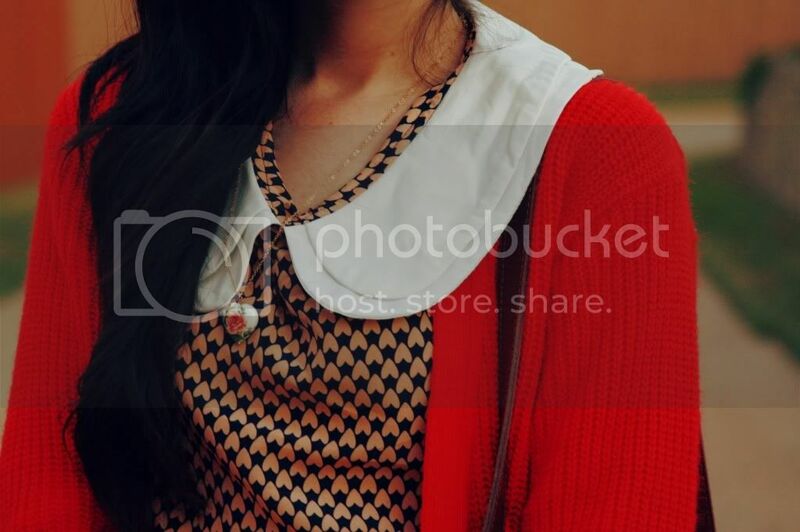 Love your peter pan collar as well! hello, the top is great is beautiful and your look is so cute. Kiss. I followed all the rules! The red pop of color is amazing! I will be including in an outfit of mine this week! Oh this would be terrific! Anyway, I'm joining your Romwe giveaway. I'm already registered at Romwe.com and I'm following your blog on bloglovin'. I followed you on Bloglovin and submitted my address to be up dated from Romwe. Lovely style and great giveaway.Did what u said. aw this would be so nice to win! thanks for the opportunity dear!